This article is about submarines powered by nuclear energy. For submarines carrying strategic nuclear weapons, see Ballistic missile submarine. A nuclear submarine is a submarine powered by a nuclear reactor. The performance advantages of nuclear submarines over "conventional" (typically diesel-electric) submarines are considerable. Nuclear propulsion, being completely independent of air, frees the submarine from the need to surface frequently, as is necessary for conventional submarines. 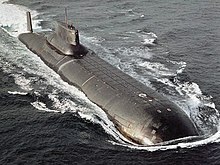 The large amount of power generated by a nuclear reactor allows nuclear submarines to operate at high speed for long periods of time; and the long interval between refuelings grants a range virtually unlimited, making the only limits on voyage times being imposed by such factors as the need to restock food or other consumables. Current generations of nuclear submarines never need to be refueled throughout their 25-year lifespans. Conversely, the limited power stored in electric batteries means that even the most advanced conventional submarine can only remain submerged for a few days at slow speed, and only a few hours at top speed, though recent advances in air-independent propulsion have somewhat ameliorated this disadvantage. The high cost of nuclear technology means that relatively few states have fielded nuclear submarines. Some of the most serious nuclear and radiation accidents ever to occur have involved Soviet nuclear submarine mishaps. USS Nautilus, the first nuclear-powered submarine. The smallest nuclear-powered submarine, the U.S. Navy's NR-1. The idea for a nuclear-powered submarine was first proposed in the United States Navy by the Naval Research Laboratory's Ross Gunn in 1939. Construction of the world's first nuclear powered submarine was made possible by the successful development of a nuclear propulsion plant by a group of scientists and engineers at the Naval Reactors Branch of the Bureau of Ships and the Atomic Energy Commission. In July 1951 the U.S. Congress authorized construction of the first nuclear-powered submarine, Nautilus, under the leadership of Captain Hyman G. Rickover, USN (sharing names with Captain Nemo's fictional submarine Nautilus in Jules Verne's Twenty Thousand Leagues Under the Sea, and another USS Nautilus (SS-168) that served with distinction in World War II). The Westinghouse Corporation was assigned to build its reactor. After the submarine was completed at the Electric Boat Company, First Lady Mamie Eisenhower broke the traditional bottle of champagne on Nautilus' bow, and she was commissioned USS Nautilus (SSN-571), on 30 September 1954. On 17 January 1955, she departed Groton, Connecticut to begin sea trials. The submarine was 320 feet (98 m) long, and cost about $55 million. The Soviet Union soon followed the United States in developing nuclear-powered submarines in the 1950s. Stimulated by the U.S. development of Nautilus, Soviet work on nuclear propulsion reactors began in the early 1950s at the Institute of Physics and Power Engineering, in Obninsk, under Anatoliy P. Alexandrov, later to become head of the Kurchatov Institute. In 1956, the first Soviet propulsion reactor designed by his team began operational testing. Meanwhile, a design team under Vladimir N. Peregudov worked on the vessel that would house the reactor. After overcoming many obstacles, including steam generation problems, radiation leaks, and other difficulties, the first nuclear submarine based on these combined efforts, K-3 Leninskiy Komsomol of the Project 627 Kit class, called a November-class submarine by NATO, entered service in the Soviet Navy in 1958. Nuclear power proved ideal for the propulsion of strategic ballistic missile submarines (SSB), greatly improving their ability to remain submerged and undetected. The world's first operational nuclear-powered ballistic missile submarine (SSBN) was USS George Washington with 16 Polaris A-1 missiles, which conducted the first SSBN deterrent patrol November 1960 – January 1961. The Soviets already had several SSBs of the Project 629 (Golf class), and were only a year behind the US with their first SSBN, ill-fated K-19 of Project 658 (Hotel class), commissioned in November 1960. However, this class carried the same three-missile armament as the Golfs. The first Soviet SSBN with 16 missiles was the Project 667A (Yankee class), the first of which entered service in 1967, by which time the US had commissioned 41 SSBNs, nicknamed the "41 for Freedom". The VMF Typhoon-class submarine is nuclear-powered and the world's largest-displacement submarine. At the height of the Cold War, approximately five to ten nuclear submarines were being commissioned from each of the four Soviet submarine yards (Sevmash in Severodvinsk, Admiralteyskiye Verfi in St. Petersburg, Krasnoye Sormovo in Nizhny Novgorod, and Amurskiy Zavod in Komsomolsk-on-Amur). From the late 1950s through the end of 1997, the Soviet Union, and later Russia, built a total of 245 nuclear submarines, more than all other nations combined. Today, six countries deploy some form of nuclear-powered strategic submarines: the United States, Russia, France, the United Kingdom, China, and India. Several other countries, including Argentina and Brazil, have ongoing projects in different phases to build nuclear-powered submarines. HMS Astute, an advanced nuclear-powered attack submarine. The main difference between conventional submarines and nuclear submarines is the power generation system. Nuclear submarines employ nuclear reactors for this task. They either generate electricity that powers electric motors connected to the propeller shaft or rely on the reactor heat to produce steam that drives steam turbines (cf. nuclear marine propulsion). Reactors used in submarines typically use highly enriched fuel (often greater than 20%) to enable them to deliver a large amount of power from a smaller reactor and operate longer between refuelings – which are difficult due to the reactor's position within the submarine's pressure hull. The nuclear reactor also supplies power to the submarine's other subsystems, such as for maintenance of air quality, fresh water production by distilling salt water from the ocean, temperature regulation, etc. All naval nuclear reactors currently in use are operated with diesel generators as a backup power system. These engines are able to provide emergency electrical power for reactor decay heat removal, as well as enough electric power to supply an emergency propulsion mechanism. Submarines may carry nuclear fuel for up to 30 years of operation. The only resource that limits the time underwater is the food supply for the crew and maintenance of the vessel. The stealth technology weakness of nuclear submarines is the need to cool the reactor even when the submarine is not moving; about 70% of the reactor output heat is dissipated into the sea water. This leaves a "thermal wake", a plume of warm water of lower density which ascends to the sea surface and creates a "thermal scar" that is observable by thermal imaging systems, e.g., FLIR. Another problem is that the reactor is always running, creating steam noise, which can be heard on SONAR, and the reactor pump (used to circulate reactor coolant), also creates noise, as opposed to a conventional submarine, which can move about on almost silent electric motors. INS Chakra leased Soviet Charlie-class submarine commissioned between 1987 – 1991. Arihant-class submarine INS Arihant commissioned in August 2016 in the Indian Navy. K-8, 1960: suffered a loss-of-coolant accident; substantial radioactivity released. K-14, 1961: the reactor compartment was replaced due to unspecified "breakdown of reactor protection systems". K-19, 1961: suffered a loss-of-coolant accident resulting in 8 deaths and more than 30 other people being over-exposed to radiation. The events on board the submarine are dramatized by the film K-19: The Widowmaker. K-11, 1965: both reactors were damaged during refueling while lifting the reactor vessel heads; reactor compartments scuttled off the east coast of Novaya Zemlya in the Kara Sea in 1966. K-27, 1968: experienced reactor core damage to one of its liquid metal (lead-bismuth) cooled VT-1 reactors, resulting in 9 fatalities and 83 other injuries; scuttled in the Kara Sea in 1982. K-140, 1968: the reactor was damaged following an uncontrolled, automatic increase in power during shipyard work. K-116, 1970: suffered a loss-of-coolant accident in the port reactor; substantial radioactivity released. K-64, 1972: the first Alfa-class liquid-metal cooled reactor failed; reactor compartment scrapped. K-222, 1980: the Papa-class submarine had a reactor accident during maintenance in the shipyard while the ship's naval crew had left for lunch. K-123, 1982: the Alfa-class submarine reactor core damaged by liquid-metal coolant leak; the sub was forced out of commission for eight years. K-431, 1985: a reactor accident while refueling resulted in 10 fatalities and 49 other people suffered radiation injuries. K-219, 1986: suffered an explosion and fire in a missile tube, eventually leading to a reactor accident; a 20-year-old enlisted seaman, Sergei Preminin, sacrificed his life to secure one of the onboard reactors. The submarine sank three days later. K-192, 1989 (reclassified from K-131): suffered a loss-of-coolant accident due to a break in the starboard reactor loop. USS Thresher (SSN-593), 1963: was lost during deep diving tests with 129 crew and shipyard personnel on board; later investigation concluded that failure of a brazed pipe joint and ice formation in the ballast blow valves prevented surfacing. The accident motivated a number of safety changes to the U.S. fleet. Thresher was the first of only two submarines to exceed 100 onboard deaths, joined by the Russian Kursk's 118 lost in 2000. K-3, 1967: the first Soviet nuclear submarine experienced a fire associated with the hydraulic system, killing 39 sailors. USS Scorpion (SSN-589), 1968: was lost at sea, evidently due to implosion upon sinking. What caused Scorpion to descend to its crush depth is not known. USS Guitarro (SSN-665), 1969: sank while pier-side in shipyard due to improper ballasting. The submarine was eventually completed and commissioned. K-8, 1970: a fire and a towing accident resulted in the boat's sinking and loss of all 52 crewmen remaining aboard. K-56, 1973: a collision with another Soviet vessel led to flooding of the battery well and many crew deaths due to chlorine gas. K-429, 1983: the sub survivably sank to the ocean bottom due to flooding from improper rig-for-dive and shipyard errors; 16 crewmen were killed. K-278 Komsomolets, 1989: the Soviet submarine sank in Barents Sea due to a fire. K-141 Kursk, 2000: lost at sea with all 118 crewmen on board; the generally accepted theory is that a leak of hydrogen peroxide in the forward torpedo room led to the detonation of a torpedo warhead, which in turn triggered the explosion of half a dozen other warheads about two minutes later. Ehime Maru and USS Greeneville, 2001: the American submarine surfaced underneath the Japanese training vessel. Nine Japanese crewmembers, students, and teachers were killed when their ship sank as a result of the collision. K-159, 2003: sank in the Barents Sea while being towed to be scrapped, killing nine crewmen. USS San Francisco (SSN-711), 2005: collided with a seamount in the Pacific Ocean. A crew member was killed and 23 others were injured. USS Miami (SSN-755), 2012: the submarine's forward compartment was destroyed by an arsonist-set fire while in shipyard, causing damage with an estimated $700 million in repair costs. While repairs were initially planned upon, due to budget cuts the boat was subsequently scrapped. ^ The only other submarine to sink a warship since World War II is the Pakistani Navy's PNS Hangor. ^ a b c d Johnston, Robert (September 23, 2007). "Deadliest radiation accidents and other events causing radiation casualties". Database of Radiological Incidents and Related Events. ^ a b c Follow TIME Facebook Twitter Google + Tumblr (25 March 2009). "The Worst Nuclear Disasters". Time. Retrieved 2 May 2012. ^ "Little Book" (PDF). Retrieved 2 May 2012. ^ "Argentina, Brazil eye joint project for nuclear submarine". The Times of India. 25 February 2008. Archived from the original on 1 March 2008. Retrieved 27 March 2008. ^ Sarah Diehl & Eduardo Fujii (March 2008). Brazil’s Pursuit of a Nuclear Submarine Raises Proliferation Concerns. WMD Insights. Archived from the original on 2008-03-16. Retrieved 27 March 2008. 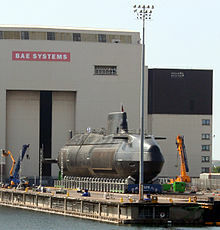 ^ "Exclusive: Royal Navy's most advanced submarine HMS Astute set for home on the River Clyde". Daily Record. 13 November 2009. Retrieved 20 November 2009. ^ Diplomat, Saurav Jha, The. "India's Undersea Deterrent". The Diplomat. Retrieved 2016-04-09. ^ "India to Build 6 Nuclear-Powered Submarines - Navy Chief". Sputnik International. Sputnik. 4 December 2015. ^ "From India Today magazine: A peek into India's top secret and costliest defence project, nuclear submarines". India Today. Retrieved 2018-12-29. ^ "À espera de Submarino Nuclear, Marinha abre concurso para submarinistas". Sputnik. 25 July 2018. ^ "Programa Nuclear da Marinha". Brazilian Navy. Retrieved 9 December 2018. ^ Kristin Shrader-Frechette (October 2011). "Fukushima, Flawed Epistemology, and Black-Swan Events" (PDF). Ethics, Policy and Environment, Vol. 14, No. 3. ^ "K-8 submarine reactor accident, 1960". Retrieved 26 July 2015. ^ a b c d "Chap. 8: Nuclear submarine accidents – The Russian Northern Fleet". Retrieved 26 July 2015. ^ "K-19 and other Subs in Peril". Retrieved 26 July 2015. ^ "How the fire-damaged USS Miami will be scrapped". The Washingtion Times. Retrieved 26 July 2015. Friedman, Norman (1984). Submarine design and development. Conway Maritime. ISBN 0-87021-954-5. Friedman, Norman (1994). U.S. submarines since 1945: an illustrated design history. Naval Institute Press. ISBN 1-55750-260-9. Offley, Edward "Ed" (2007). Scorpion Down (Hardcover ed.). New York: Basic Books by Perseus Press. ISBN 978-0-465-05185-4. Polmar, Norman & Moore, J.K. (2004). Cold War Submarines: The Design and Construction of U.S. and Soviet Submarines (Paperback ed.). Washington, DC: Potomac Books, Inc. ISBN 1-57488-530-8. Wikimedia Commons has media related to Nuclear submarines.